UFC Embedded is an unscripted documentary series, covering the daily life of UFC fighters as they promote and prepare for their next fight inside the Octagon. Each episode covers 1 day in the 6 day lead up to a Pay-Per-View event and edited within 24 hours by an amazing team. To date, I have shot & field produced over 200 episodes of this show, covering some of the largest stars in the sport: Conor McGregor, Ronda Rousey, Dana White, Donald "Cowboy" Cerrone, TJ Dillashaw, and Dominck Cruz. Conor McGregor - All scenes below with Conor McGregor and Dana White were filmed and field produced by me. The Emmy Award winning series I shoot during every UFC Pay Per View event is UFC Fight Flashback. Most Episodes are found in the UFC's paid platform UFC Fight Pass. Another awesome project I had the opportunity to work on was a surprise concert by Imagine Dragons. We shot this on the Las Vegas Strip, using multiple Canon c300's. Some quick screen grabs from behind the scenes as I shot the commercials above. 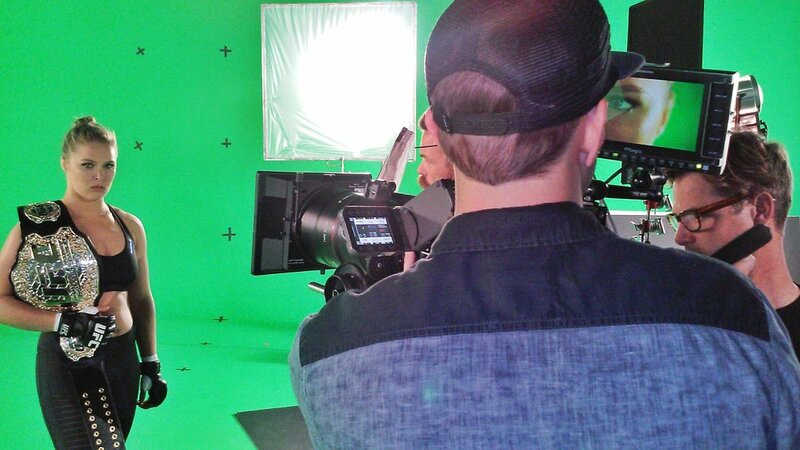 Filming on a soundstage in Las Vegas, I teamed up with the visual fx team to create a green screen that we could track our shots on for different backgrounds that would be created later in post. I found a spot on the outskirts of the Las Vegas city lights, where I could shoot numerous landscape shots at 6k. This would later be pieced together by our visual effects team to create the final UFC 200 teaser promo above.